Now, here’s the thing…he’s a really nice guy. He’s got this adorable little Irish brogue, and he’s totally genuine. We just never really know when the things that need to be done will actually get done. For example, when Patrice and I moved in, we discovered that our place had a few issues. which have been conspicuously taped over. Shockingly, they resemble a head, a fist, a knee and a foot. 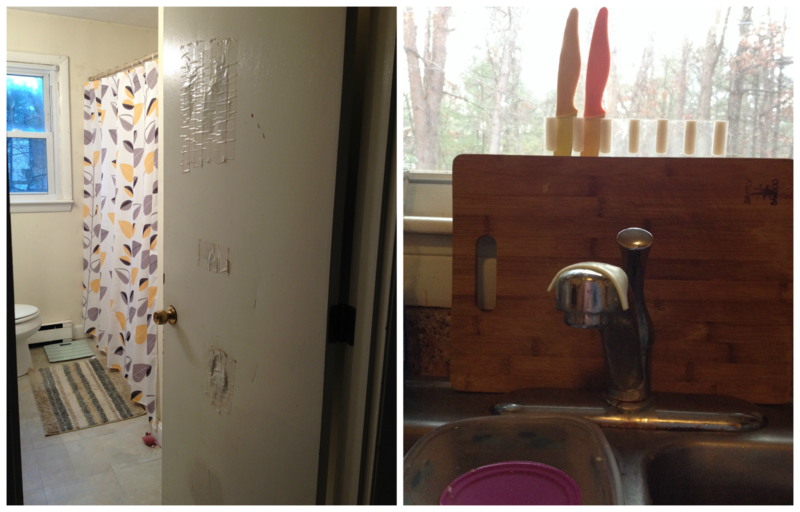 In other fun news, we also discovered our faucet has a hole in the side of it. A hole. ^^^ That is not cheese on our faucet. That’s tape to stop it from spraying. Ugh. We moved into this apartment in May and were promised a brand new door. as well as repairs to the, y’know, the electrical shorts that keep happening in the kitchen? Yeah, that can’t be fixed today. That has to be another day, so it will probably remain as is until I move. Anyway, when he called last night, he informed me that one of us has to be home all day. Because we don’t have jobs or anything. watching a strange man replace a door in my apartment and hoping that nothing else breaks before I move.